Employees of the West Rand District Municipality took to the streets in protest after saying that they hadn’t been paid for the past three months. 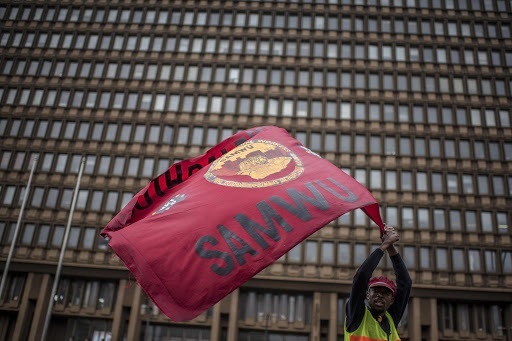 Gathering at the Mary Fitzgerald Square in Johannesburg on Wednesday, workers belonging to the Democratic Municipal and Allied Workers Union of South Africa (Demawusa) and the South African Municipal Workers’ Union (Samwu) called on Gauteng Premier David Makhura to intervene and address their grievances. It was reported last month that the municipality, which had invested over R70 million in the now liquidated VBS Mutual Bank, couldn’t pay workers’ salaries. This led to workers holding councillors hostage during a counsel sitting. Workers demanded that their salaries be paid and kept the councillors locked in council chambers until just after midnight and let them go after they were promised that they would be paid. Workers marched to Makhura’s office and waited for him to receive their memorandum of demands. In addition to not receiving their salaries, the workers said they also hadn’t received benefits, including medical aid, and they feared losing their homes because they couldn’t pay their bonds. The workers parked municipal vehicles in front of Makhura’s office, and threatened to lock them up until their demands were met. One of the leaders at the forefront of the strike, Bongani Mgcina, said that they wanted the premier’s full attention on the matter. “We’re getting the sense here that we’re being played and taken for fools and we can’t tolerate that. We are not moving from what we’ve said, there’s no service that we’re rendering. All municipal vehicles, all fire engines and rescue [vehicles] are here [with us],” Mgcina said, speaking to eNCA prior to the march. “We want the premier to give us attention. The people he delegated to come attend to us [MECs Panyaza Lesufi, Jacob Mamabolo and Uhuru Moiloa], they’ve not helped us. We can’t take this any more. We are going to the office of the premier to say ‘you are the head of the government, help our situation’. This municipality will not help itself out of this mess, it’s a mess that needs the provincial government to intervene,” Mgcina said. Demawusa spokesperson Ayanda Yawua told EWN that the union didn’t believe that the municipality had no money to pay workers “but invested an amount of R77 million with VBS”. “We are just wondering why the municipality invested but [claimed] that they don’t have money,” Yawua said. Makhura is yet to receive the memorandum and respond to the demands.